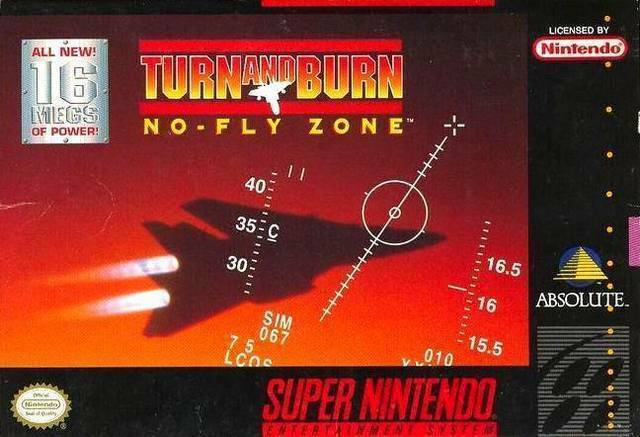 Turn and Burn: No-Fly Zone for Super Nintendo allows you to hop into an F-14 Tomcat, take off from your carrier, and get ready for dogfights at supersonic speeds. The fully-rotational Mode 7 horizon should give you a run for your money, as you fly blue water operations through mind-blowing combat simulation. Your skills will really be put to the test when you enter a series of daring nighttime carrier landings, but that's baby food compared to the full-throttle avionic warfare you'll engage in later. Full displays and advanced weaponry are included such as the M61A1 Vulcan Cannon, Sidewinders, and Phoenix Missiles, but so are super-intelligent enemy bogeys. For 1 player.